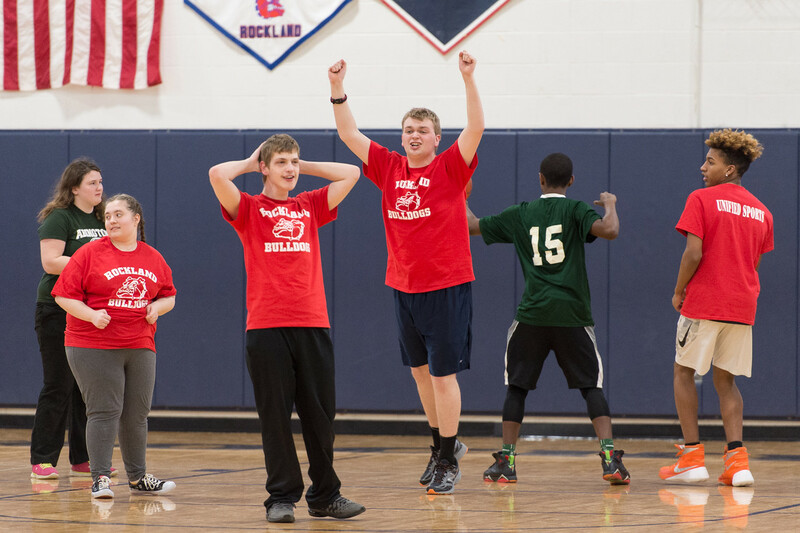 Rockland High School hosted a unified basketball game on Monday, March 13 against Abington. Unified sports are part of the Special Olympics model. It was a fun game to watch shown by the atmosphere and enthusiasm of the crowd. RHS teachers Amanda Lanigan and Joanne White both attended the game as fans. Michael Bodley, who is a junior, had a lot of fun playing, dribbling, going coast to coast and rebounding. He said it was great and was very happy to see all the fans who attended. Bodley’s favorite part was passing, rebounding and defense. Nobody was entering the paint when he had his hands up. The unified basketball and soccer games started four years ago with Abington. This year, Carver High School joined the soccer games, and Mr. Graziano hopes to add more schools from the South Shore. He explained that Rockland wanted to start the unified program to give kids in the special needs program a chance to play in front of the amazing Rockland fan base. photos by Veritas Staff and William Marquardt. Anthony Ambrose brings the ball up court.